The Details: As much of a Yu Yu Hakusho junkie as I am, I'm sure it's obvious that I would have tons of Hunter x Hunter cels if this series had come out just a few years earlier. Not only because I'm a Yu Yu fan, but also because I became a big fan of this story as well. The only manga series that has me gnashing my teeth MORE over wishing for progress is Clamp's X. So far my Hunter x Hunter collection is very minimal, and very heavy on the fixating on Killua side of things. 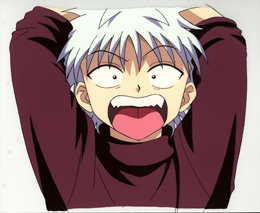 I have a little more Killua, plus Killua and Gon... I also have a nice shitajiki that's a collage of Killua and Gon pictures... ;) (No, I don't scan my shitajiki.) In my rare bad moments of browsing through cel shops I keep an eye out for the cel of Hisoka that will make me forget I can't really afford cels anymore. Eventually it'll jump out and bite me... so goes the life of an addict. I also wouldn't mind finding good cels of Biske (Bisquit) and several of the Spiders. Though, of course, if I gave my sickly little brain half a chance to think about it there'd be hundreds of cels I would dearly love to get. Indeed, this series should be up at the top with Yu Yu Hakusho and Flame of Recca. Comments: I have yet to ID this cel. I'm pretty sure (while watching the recap in the final episode) I saw Killua wearing this outfit and flipping out when he catches a fish on the ship (fishing with Gon). Unfortunately I loaned my DVDs to a friend, so it'll be a while before I can make a proper ID. Episode #: 29: End of Exams x Failed? x Pass! Comments: (End of Hunter Exam SPOILER!) 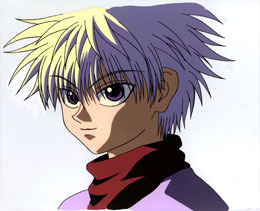 Right after Killua announces his "defeat" in round 6 of the Hunter Exam's little finals tournament, because he thought Pokkuro would be too boring to fight and assumed he would have no trouble winning his next fight, he returns to his spot on the sidelines and turns around to face the fighting area. He still has the teensiest little cocky smirk as he turns. I love the twilight lighting in this cel (this takes place indoors, but the light became dimmer around the time of the Gon and Hanzo fight).